The very first Dyslexia Awards took place on saturday 26th Novmeber 2017, at Enginuity in Coalbrookdale. It was an evening filled with excitement, nerves and mostly positivity & celebrations. With 160 guests in attendance, Shropshire’s first Dyslexia Awards was a huge success! with 16 award winners announced on the night, good food, great company and the focus on the positive side of dyslexia, its safe to say that all in attendance enjoyed the evening immensely! 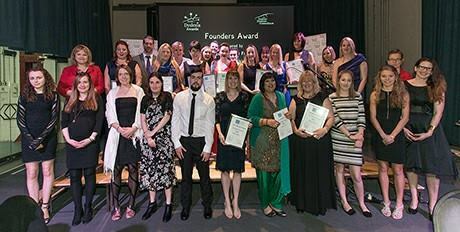 Winners of the 2016 Dyslexia Awards include, Lindy Smiths Cakes bagging two awards -Amazing Art Award & Entrepreneur Award; Julie Meijiero – Best Learning Support Award; Samantha Harris Outstanding Personal Achievement Award; Michael Hannah – Apprentice Award and Katie Mckeown who won the special ‘Founders’ Award for dedication to dyslexic children in Telford. Many sponsors including Global Freight Services Ltd, In The Loop, Special-T Assessments and Kay Heald HR were so impressed with the success of the 2016 Dyslexia Awards, they all pledged their continued support before the evening was even over. It is with great pride and delight that Dyslexia Awards founder Elizabeth Wilkinson opens the 2017 Dyslexia Awards nominations this bank holiday weekend. You can find award information and make nominations: www.theddc.org.uk/dyslexiaawards/ or by post, simply down load the nomination form. The 2017 Dyslexia Awards will take place at Enginuity on the evening of Saturday 25th November 2017, all finalists will receive a free ticket to attend the awards.